ABBOTT MOTORS, An exceptional car buying Experience, is offering this exceptional vehicle for sale. ABBOTT MOTORS has over 50 years of automotive experience! We are also a CARFAX Advantage Dealer. We offer great deals and specialize in FINANCING FOR EVERYONE-ALL CREDIT APPS ACCEPTED! We look forward to helping you purchase your next vehicle. CALL or TEXT (716) 229-5711 for quick answers to your questions about this vehicle. Your message will be answered by a real human never an automated system When you purchase a vehicle with the CARFAX Buyback Guarantee, you're getting what you paid for. 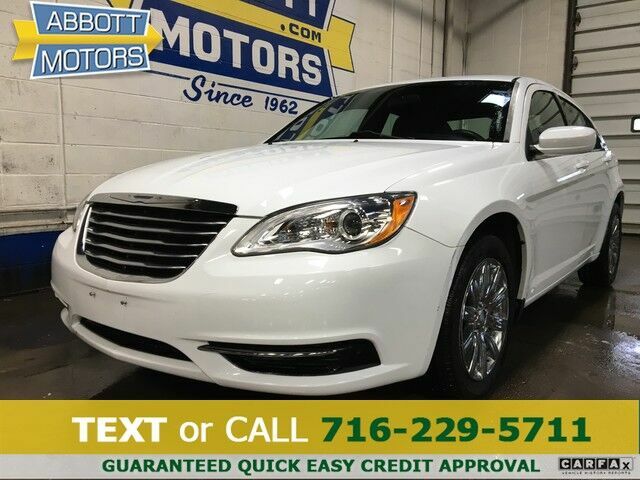 You could spend more on fuel each month than on your vehicle payments, so why not consider one with exceptional fuel economy like this 2013 Chrysler 200. This 2013 Chrysler 200 has such low mileage it has been parked more than driven. This gently driven vehicle has been well-kept and still has the showroom shine. This impeccably built Chrysler 200 Touring comes with a plethora of added features that have made this vehicle a unique find. These options will simply amplify the experience of owning and driving this wonderfully crafted Chrysler. This Chrysler 200 comes with recently replaced all-season tires for an improved ride, better fuel economy and quieter drive. This Chrysler 200 Touring has a flawless finish that complements its wonderful interior. This Chrysler 200 comes equipped with hard-to-find custom wheels. More information about the 2013 Chrysler 200: The 2013 Chrysler 200 offers much to like for buyers interested in a stylish, economical, and inexpensive mid-size sedan. Features such as a powerful 283-hp V6 as well as a true 4-seat convertible both are available mean even the budget-conscious can afford both performance and luxury. Interesting features of this model are good V6 power, convertible availability, low price of entry, and Fuel economy STOP IN TODAY or Apply Online 24/7 at Abbottmotors.com ... All Trade-ins Welcome... Same Day Delivery... Call or Text Today and See The Difference... We Look Forward to Serving You! !This vehicle may be subject to potential open recall(s). Vehicle recall information may be found at Safecar.gov. Please verify price, equipment, options and features with your sales rep before your purchase. We Look Forward to Serving You. *Tax, title, plates extra. All Financing On Approved Credit. BBB accredited A+ member.